Arrival Varanasi. Meeting and Greeting at the airport / railway station. Transfer to hotel for overnight stay. Early morning boat ride at river Ganges to view Sunrise. After that trip to Sarnath - The site where Lord Buddha preached his first sermon after attaining enlightenment (12 kms from Varanasi) visiting Dhamekh Stupa and Museum. Afternoon drive to Sravati ( 300 kms / 08 hrs drive). On arrival, transfer to hotel. Overnight stay at Sravasti hotel. 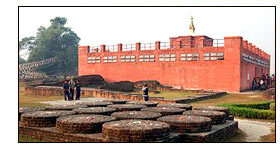 Sravasti - Lord Buddha is believe to have spent 25 rainy seasons here preaching his teachings. Morning visit Sahet Mahet, capital of ancient Kingdom of Kosala, Jetvana Vihar and Buddhist temples. Afternoon drive to Lumbini (225 kms / 5.30 hrs drive). On arrival, transfer to hotel for overnight stay. Morning visit Mahadevi temple - the birth place of Lord Buddha. Afternoon drive to Kushinagar (180 kms / 05 hrs drive). On arrival Kushinagar, check in at hotel. Overnight stay at Kushinagar hotel. After breakfast drive to Patna via Vaishali. 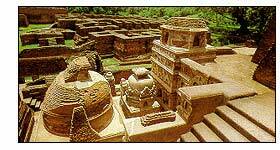 Vaishali is believed to be the first republic of the world, having an elected body of representatives hold special significance for Buddhist devotees. Afterthat continue drive to Patna (55 kms from Vaishali). On arrival Patna, transfer to hotel. Overnight in Patna. Morning leave Patna for Bodhgaya (182 kms - 6 hrs) enroute visiting Rajgir and Nalanda. Rajgir was the capital of Magadh Empire around 800 BC and an important Buddhist pilgrimage site since the Buddha spent 12 years here. Visit Gridhakuta Hill, Bimbisara jail. Also visit to Nalanda - of the oldest Universities of the World and International Centre for Buddhist Studies. Afterthat drive to Bodhgaya. Overnight in Bodhgaya. Bodhgaya - the most important Buddhist pilgrimage center, is the place where Lord Buddha entered into meditation after being moved by the sufferings of mankind. Full day sightseeing visiting Mahabodhi Temple, Niranjana River and Sujata Village. Overnight stay at Bodhgaya Hotel. Departure transfer to Gaya airport to connect flight for onward destination.